The Buffalo Bill Center of the West’s success has largely been a result of the unparalleled efforts of its volunteers. Our volunteering supporters number more than 250, and they collectively contribute more than 12,000 hours annually! 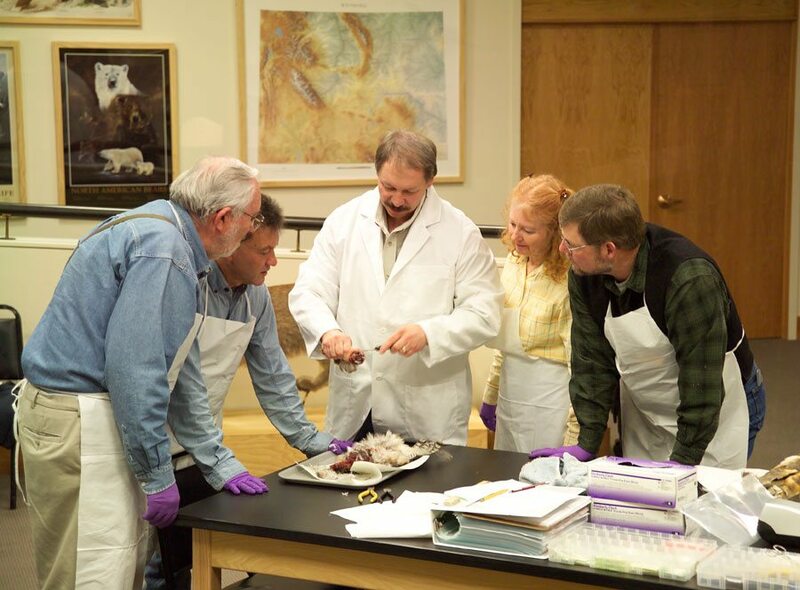 Draper Natural History Museum Curator Dr. Charles R. Preston (in lab coat) works with volunteers in the lab: (left – right) Don Chaffey, Richard Gruber, Preston, Anne Hay, and Richard Jones, research assistant. Click here to sign up to become a volunteer today! Save this application to your computer, fill it out, and then e-mail it to Terry Harley. While the Buffalo Bill Center of the West does attempt to recognize volunteers through an annual banquet and benefits, all of the volunteers say they participate because of the personal satisfaction it delivers. Volunteers have numerous opportunities to share their life and work skills at the Center. Activities cover the entire spectrum of museum-related support functions. Some individuals enjoy being docents or leading children or family activities, and other dedicated volunteers deliver indispensable service behind the scenes. These hidden roles range from assisting in administrative operations to helping set up exhibitions. Terry Harley is happy to answer any questions. Call her at 307-578-4089. 25 hours Invitation to the Annual Volunteer Appreciation event. Annual family membership to the Buffalo Bill Center of the West. For pre-existing members, a $25 gift certificate to our exclusive Museum Store. Two guest passes to the Center of the West. Each additional 50 hours $20 gift certificate. Hours are accumulated according to the calendar year. If enough hours are not accumulated in one category to earn a benefit, they can be carried over to the next year.